Gastropubs – O Hei There! Last last time, my group of three started with the Prince size chacuterie platter. And like last time, it was more than enough to satisfy the party. 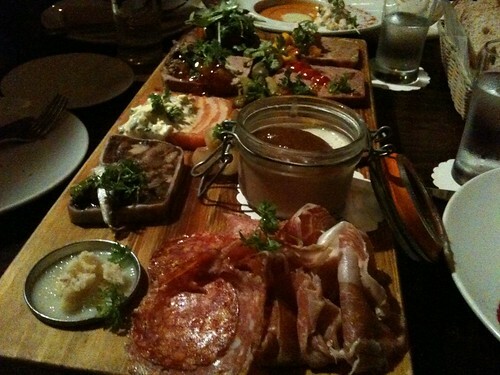 This time around, we had: the smoked salmon terrine, the chicken liver & foie gras mousse, the foie gras, the rabbit & pistachio terrine, and the cured meats selection. I had the second, third, and fifth varieties on the first visit. 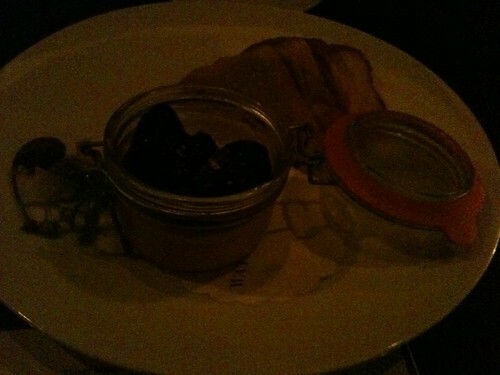 The chicken liver & foie gras mousse, this time presented in a jar (as opposed to being a cut of terrine the last time) was just as good as I remembered; went really well with the accompanying (sweet potato?) jam and brioche. The rabbit & pistachio terrine was actually an improvement; the terrine wasn’t as tough, and the pistachio flavor was a bit more pronounced. 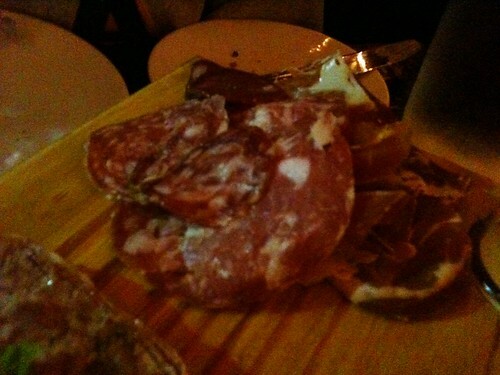 The quality and variety of the cured meats was great as well. 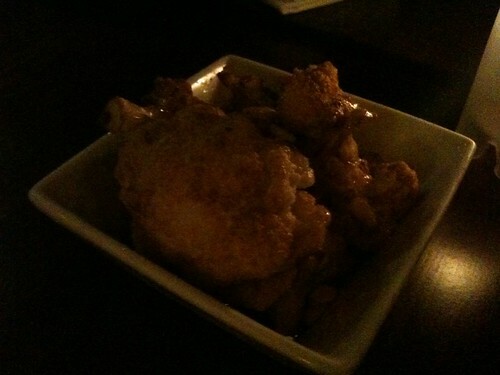 I ate lots of the beef fat drippings with the meats (fatty heaven w/ a nice horseradish kick). 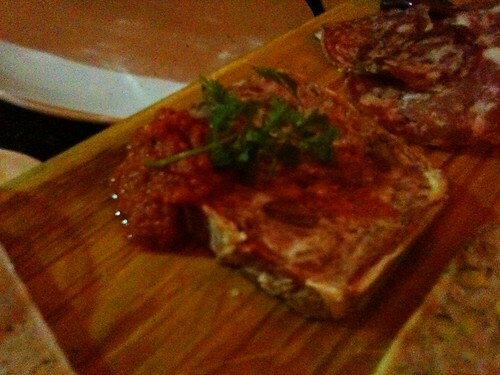 The two new types of house-made chacuterie varieties that I tried this time around were good as well. 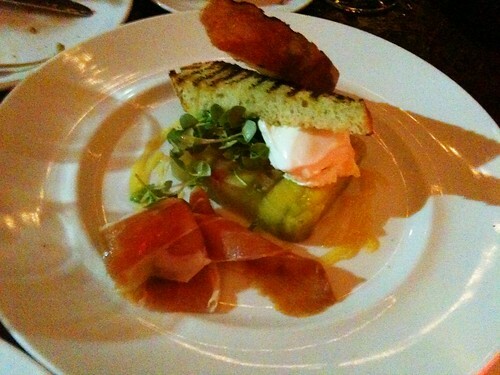 The smoked salmon terrine was nice, but I’m not too crazy about the potato filler within the terrine. But the standout (next to the mousse) was the foie gras; presented in a jar, it was just straight-up foie in all its fatty glory (not in terrine form). Well worth the extra $10 to add to the Prince selection. By the way, while they’re always nice in refilling the accompanying brioche, I usually like to try the pates/terrines with their variety of house-baked breads as well. Delicious! 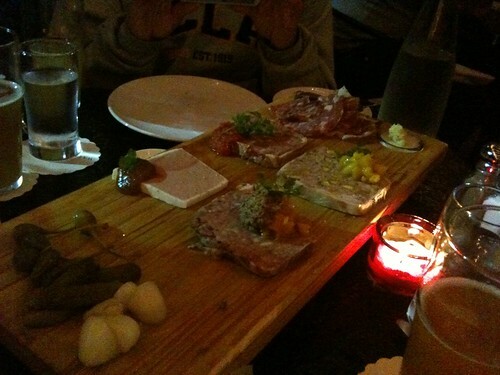 Overall, I believe that Waterloo & City has the best chacuterie platter in Los Angeles. Beside the gigantic platter, we split an appetizer and a pizza. 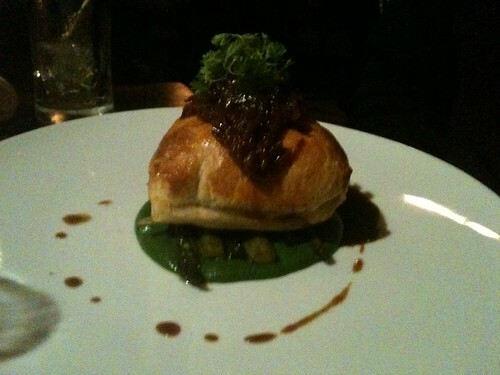 The appetizer was a special: the Manchester quail farce (stuffed) w/ duck pate. 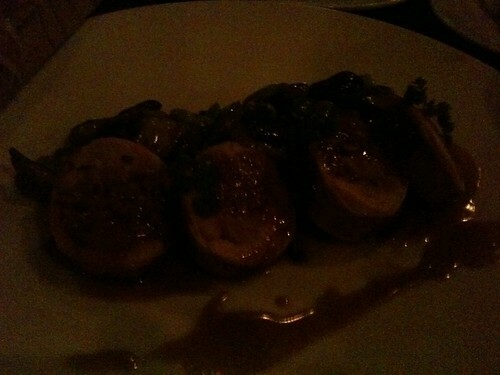 There was a wonderful jus with the quail, and the sauteed mushrooms and fava beans were nice complements. 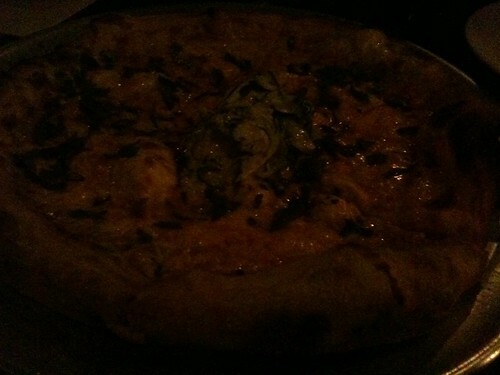 Alex, seeing brown, had to get the Indian-style pizza. It was a pleasant surprise; not a traditional pizza by any sense (as is the case with just about all of their pizzas – think more ethnic versions along the lines of CPK pizzas), but flavors were on point, and the raita-esque sauce served as a good balance. 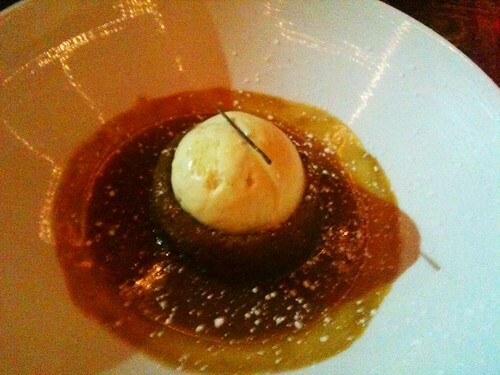 For dessert, the sticky toffee pudding was a must-order. As good as I remembered it. I actually thought that this meal at Waterloo & City was better than my first one, although when I compared them side-by-side, they seem fairly identical. Maybe I just miss this type of food, or maybe it has taken me this long to truly appreciate the intricacies of a top-notch gastropub. It has the essence of a traditional one, but incorporates other cuisines and techniques very successfully. Credit to Chef Collins. 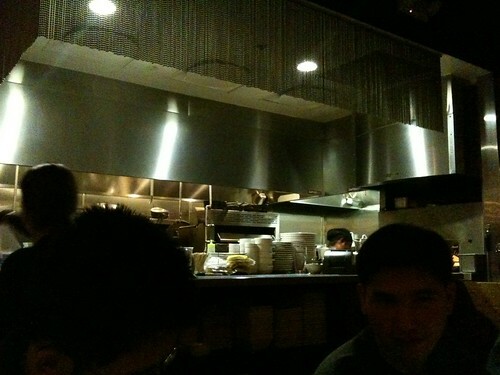 My next meal here will be much, much sooner. A group of us went to Lazy Ox Canteen the Friday before my birthday early last month as a celebration of sorts, since I wasn’t planning on doing anything special this year due to my much-anticipated trip to Urasawa the next day. Little did I know that it would become the last Friday in the Josef Centeno regime at the restaurant, as announcements about his departure came out the following week. Good timing, I suppose. Even though Chef Centeno wasn’t in the kitchen that night (he was probably at Baco Mercat), I expected great things out of this kitchen. We arrived promptly for our reservation that night, but the party before us refused to leave, even ordering another round of drinks apparently after our arrival. 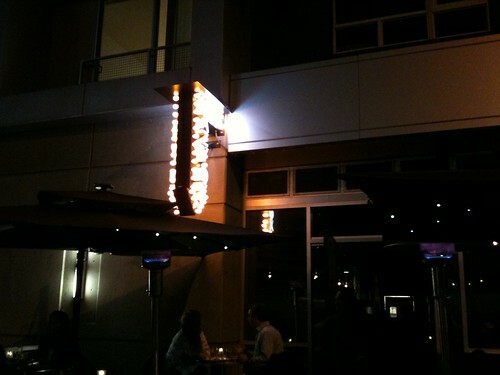 But the FOH was great at keeping us informed on the status of that party, and even combined a couple of the small tables on the patio for us while we waited to be seated inside. 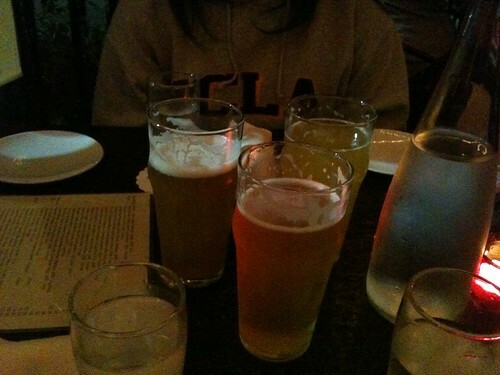 In the meantime, we ordered drinks and a couple of dishes to get us started. It’s a bit hard to describe what type of restaurant Lazy Ox Canteen is. I guess it qualifies as a gastropub. 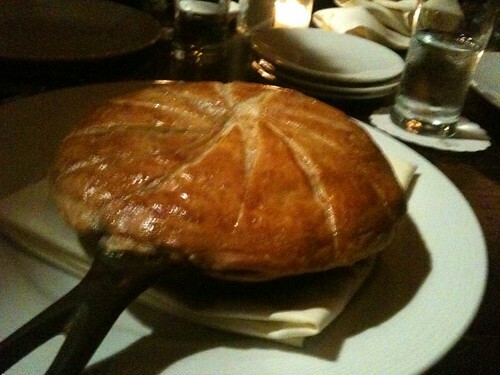 But as far as cuisine is concerned, it really doesn’t restrict itself to any particular one. 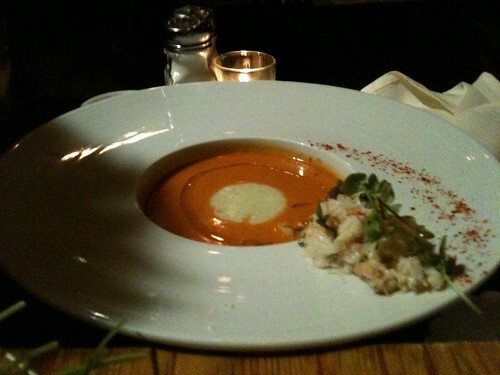 There are touches of American, Spanish, Japanese, and other cuisines, often coexisting on one plate. This was very nice. 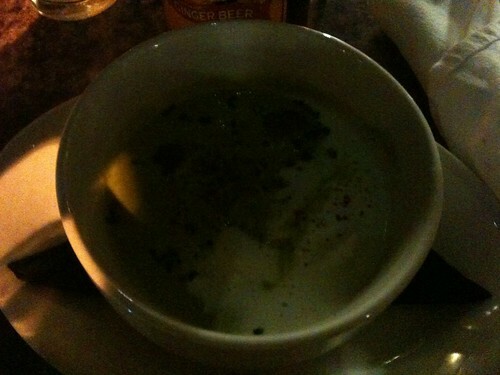 The soup was thick and creamy, as if it was just purely pureed poblano peppers. The pork belly chicharon was a nice contextual contrast, as the grapes were nice tart contrasts to cut the creaminess of the soup. Another winner right out of the gate. 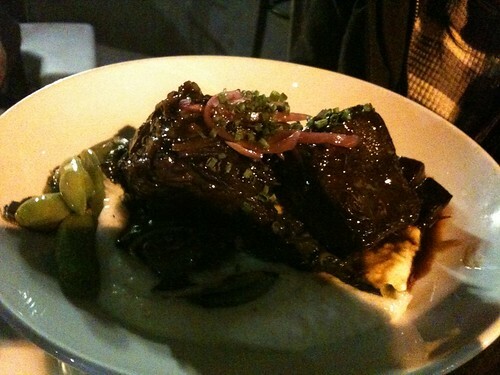 The short ribs were braised perfectly, and the cream of wheat was smooth and creamy like a polenta. However, this was quite underwhelming. 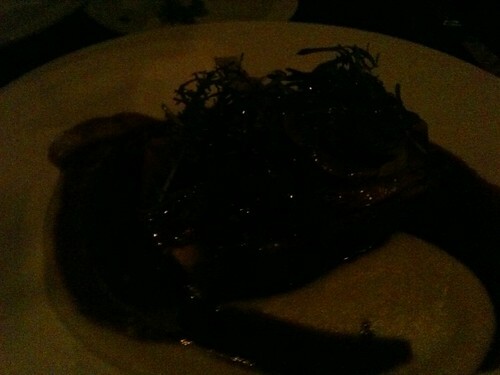 Very lifeless compared to the previous two dishes, as the liver was deli-generic. We ordered two of these so everyone could try some. The meat blend was nice and juicy, cooked a perfect medium-rare on the first one. The second one, however, was less successful. A bit tough, and heavy on the batter. 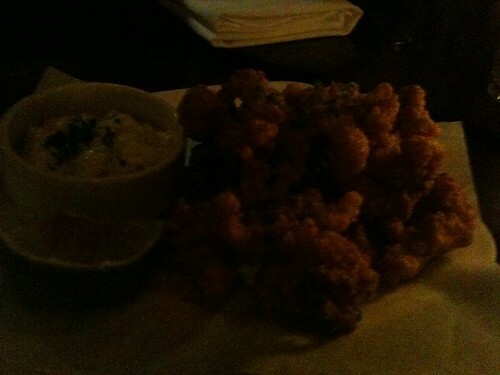 Couldn’t really tell if they were anything but basic fried clams. 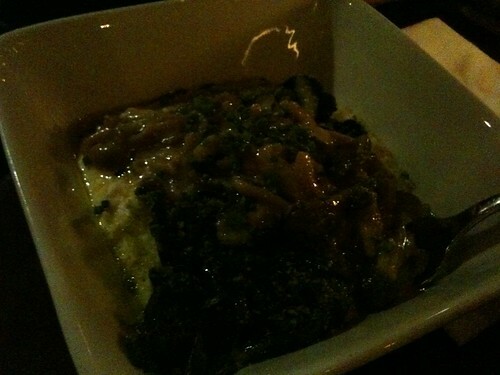 While $9 for a veggie dish is meh, this was a great dish. Everything together tasted like a tom yum soup of sorts. 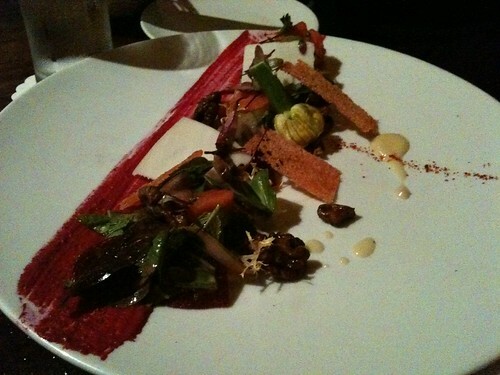 Another great veggie dish. The bacon in this looked and tasted like pancetta, and gave it a nice savory flavor. 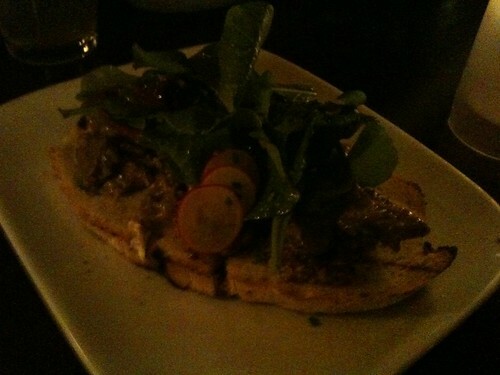 Judging from this and the chicken livers, it appeared that these type of dishes aren’t really the restaurant’s forte. Underwhelming like the liver. Very gamey (which I like) and was cooked well. Kind of like a lamb carnitas of sorts. Solid, but not spectacular, dish. 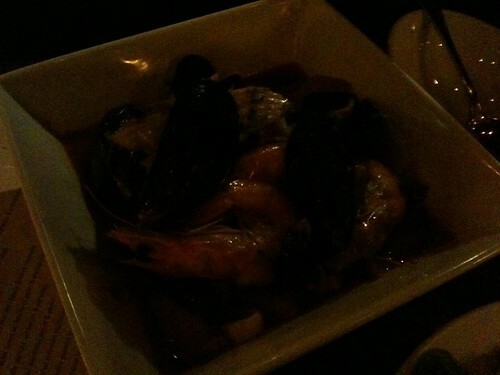 The bouillabaisse came with a salad, which went largely untouched. This was recommended by our server. It was a great pick. The creamy polenta went really well with the mushrooms, and the curry powder wasn’t overpowering, giving it just enough of the flavor. 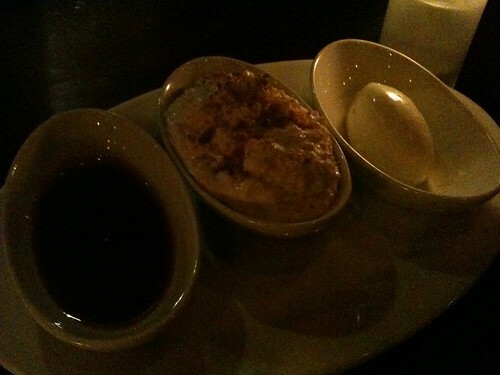 We were really stuffed by this point, but had to get one dessert. Of course, we got their most popular one. Looked pretty boring (okay, very boring), but it was delicious! Mix it with the caramel sauce and the creme fraiche, and I’ll beat up any senior citizens who get in my way of this. 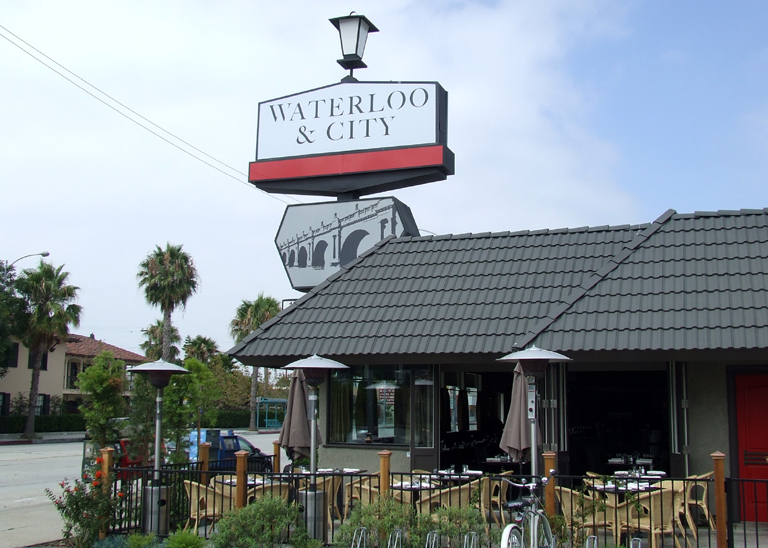 I didn’t realize that Waterloo & City was right next to A-Frame, which I found out when I went to the latter a couple of Wednesdays ago. After hearing glowing reviews of the restaurant from coworkers, I felt that I had to make a visit before I moved out of the area at the end of this month. So when Jeannie and Joseph came over to help me move and have dinner around the area last Friday, I took this opportunity to finally visit the British gastropub, named after a short underground railroad line in London. Our draft beers. Jeannie also ordered a glass of red. What an alcoholic. Three varieties of bread, deliciously fresh out of the oven. If there is one thing to order at Waterloo & City, it has to be the charcuterie platter. 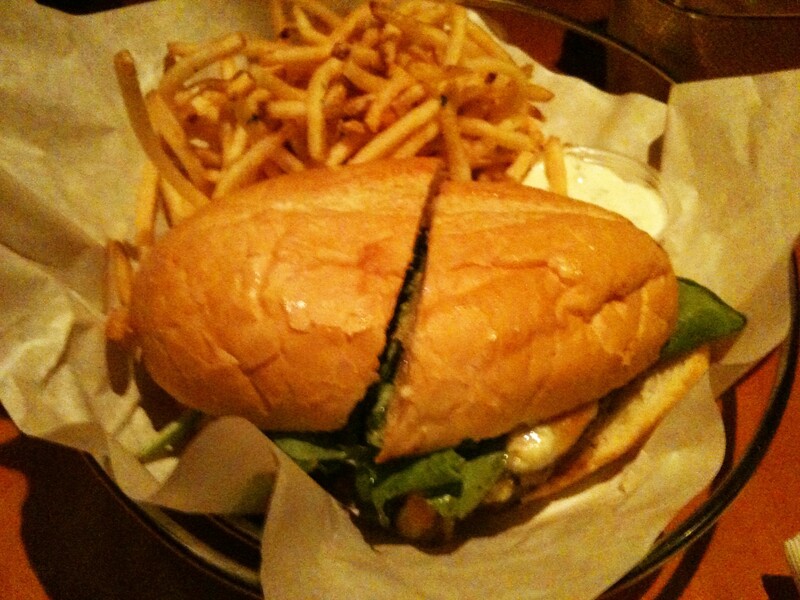 For the three of us, our server suggested the prince (medium) one. I really liked this idea of the platter, since I really wanted to try a variety. 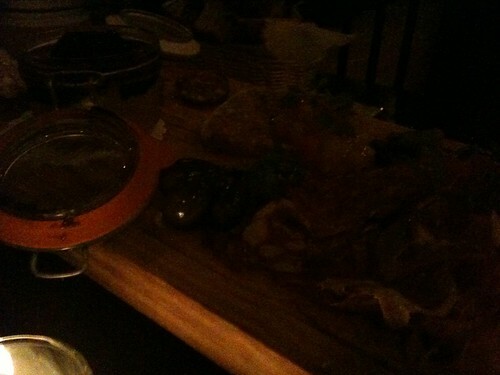 From this, we got to taste around half of what the restaurant had to offer that night. 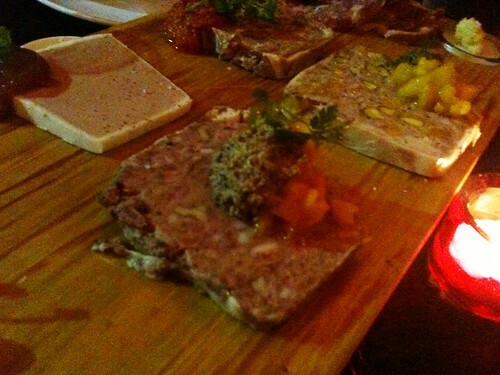 I definitely want to try some of the other options on possible future visits, like smoked tongue and carrot terrine. 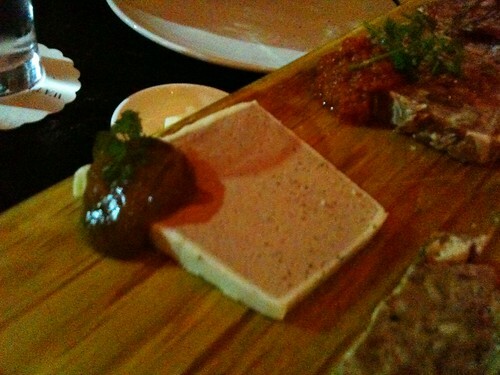 Nice combination of sweet from the marmalade and savory from the pate, with a nice hint of nuttiness from the walnut. Very creamy and smooth. The soft texture was like cream cheese. Went really well with the toasted brioche that came with the platter. My least favorite of the selections, but it was good nonetheless. I think it’s because the texture was a little tougher, and the pistachio didn’t add much flavor or contrast. This was actually one of the specials of the day, and we decided to choose it as one of the platter selections. Arguably my favorite of the bunch, with a slight kick of spice. Nothing noteworthy, just a tasty combination of prosciutto, salami and capocollo(?). 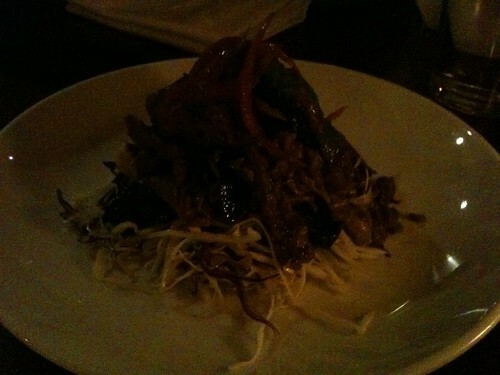 The pickled veggies were a nice complement to all the salty meats. I really didn’t know what to order, since the menu seems to vary from traditional British pub fare to bistro fare to even a little Italian. 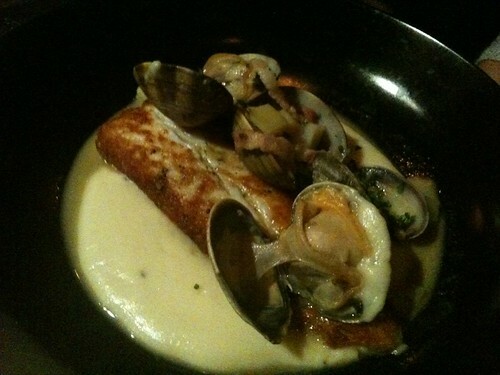 Our server, who was very helpful throughout the night, suggested this dish, which was one of the specials that night. 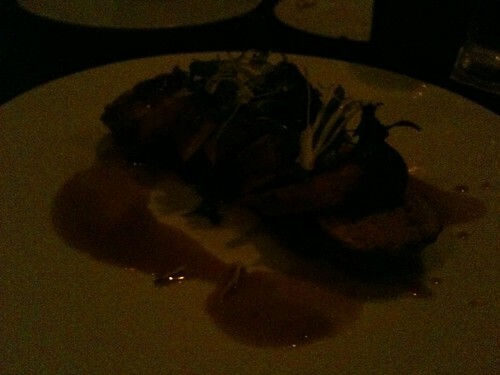 The veal was so juicy and tender. 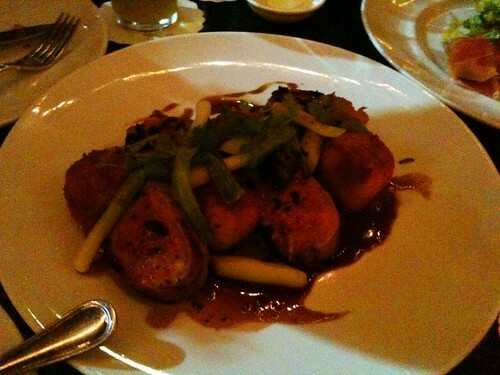 I wasn’t sure how the croquettes and leeks would fit in, but they were delicious as well. 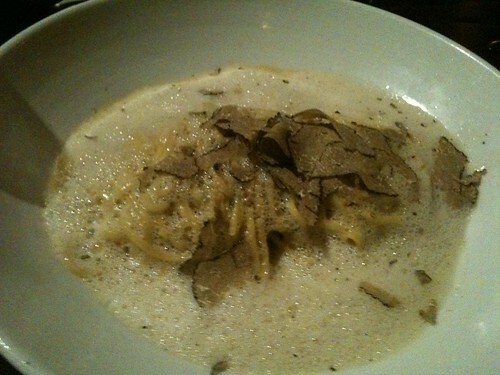 This was probably my favorite dish of the night. 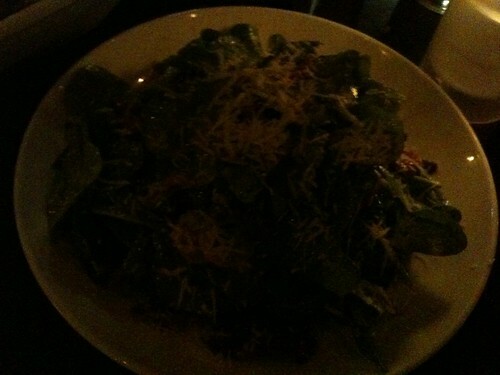 With all the meats we ordered, I felt that we had to get some veggies. Nonsense! 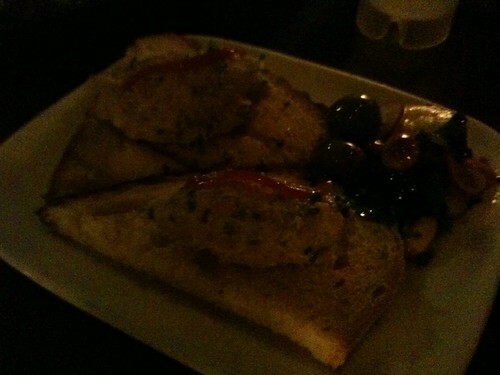 Well, I had heard good things of the tomato terrine, another one of the specials. 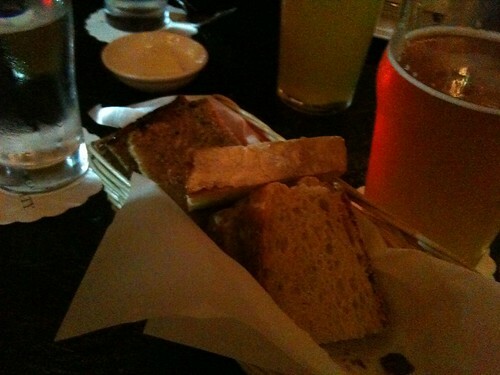 It was a nice contrast to the other things we ordered, cool and refreshing. I already had my heart set on ordering this famous dessert of theirs, but it was brought to our table before I had a chance to look at the desserts menu. 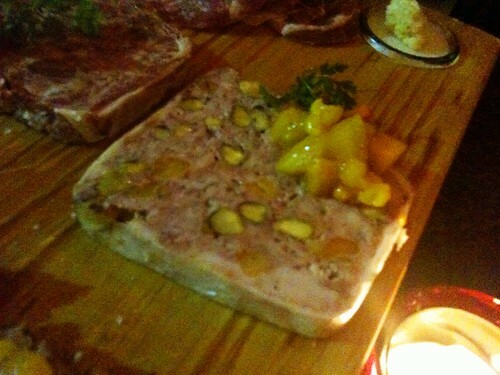 The rabbit and pistachio terrine had a piece of plastic wrap on it. I didn’t say anything, because it didn’t deter from the dish and it wasn’t a big deal. 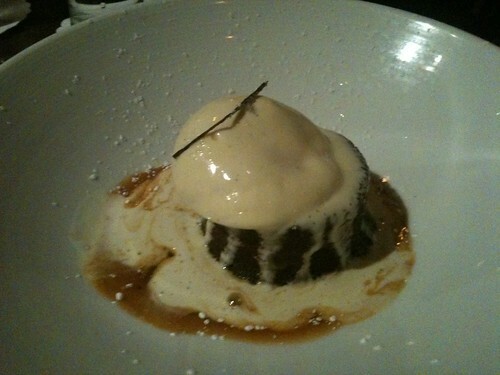 But our server was apologetic, and comped us the dessert as a result. We really appreciated it! 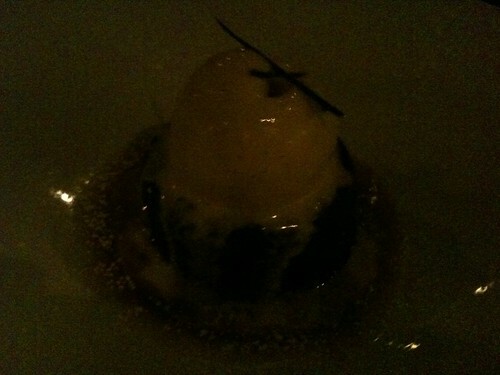 The dessert was extremely sweet, but the ice cream provided a nice balance. 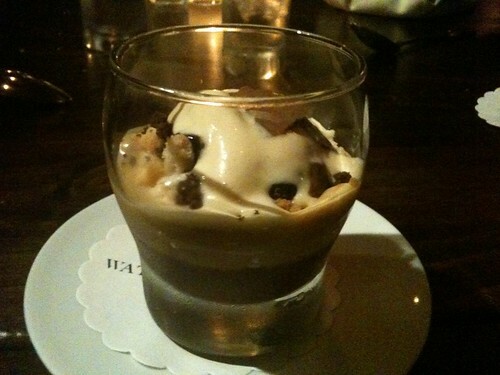 Overall, an awesome dessert. 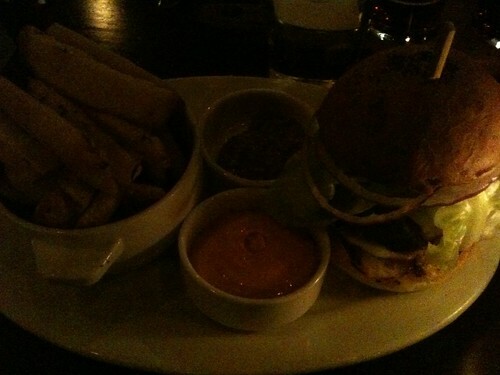 It’s unfortunate that I didn’t have a chance to visit Waterloo & City more often, now that I’m moving out of the area. 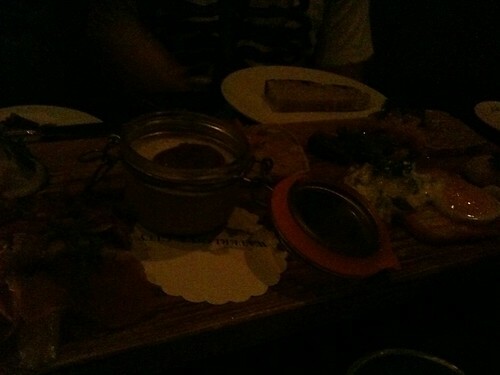 I would definitely come back to try some of the other charcuterie and more traditional British pub dishes like shepherd’s pie and the medium-rare pork chop with black pudding that I’ve heard so much about – didn’t remember seeing either on the menu that night though (my coworker also suggested the tuna tartare – but come on, tuna tartare…at a gastropub? we’ll see). This was my first time at a gastropub (I don’t really consider Ford’s Filling Station or even Father’s Office as such), and it alleviated any doubt I had about the fare being boring. Father’s Office, you elitist, inconsistent, snobby jerks. You sit high and mighty on your throne of lies as having the best burgers in L.A., and deny the peasants and serfs known as your customers the right to use ketchup. You arrogantly charge $14 for the burgers and think you’re giving the commoners a bargain. And for all your hoity-toity attitude and service, I’ve gotten a significantly different experience from the same burger on each visit. What gives? Anyways, I have to admit, despite all the ranting from the previous paragraph, the Office Burger was pretty damn good on this visit. There was a time not too long ago when I was amongst the believers of this burger being the best in L.A. Then the quality went down the next two visits. The it went up again. Then down. I just didn’t know what to believe in anymore. But back to this visit – the patty was a perfect medium rare, the caramelized onions were delicious, and the cheese was just the right amount. It’s definitely on the right side again, but I reserve judgment on the Office Burger being in the upper echelon of burgers until it becomes more consistent. 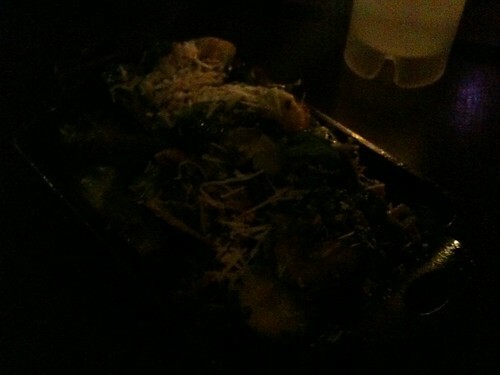 For this visit, however, it was very good. Note: credit LAist for the first photo. 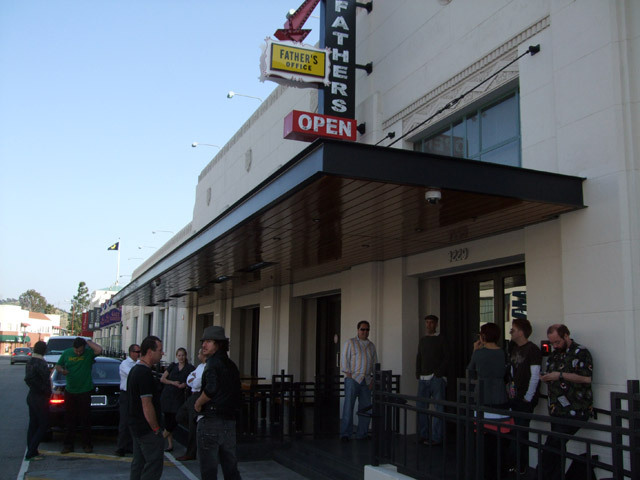 Also, this review subsequently moved Fatburger down to a B.